"He has a new book of sketches recently out which he is going to send you in a few days, most of the sketches are old, but some few are new." Sketches, New and Old was Mark Twain's most ambitious, most thoroughly sifted, and most fully revised collection of his apprentice work. It was also his final one. Alone among the sketchbooks considered here, SkNO became part of the official Writings of Mark Twain which the American Publishing Company began to issue in 1899. It was reprinted several times between 1875 and 1899, and it stood, in the author's lifetime, as the only authorized and widely available edition of sketches written before the author was forty years old (Branch and Hirst, p. 617). The 1875 first edition featured 63 items, most were about 1500 words in length and all but seven were previously published. The original index lists a short sketch titled "From 'Hospital Days'" but that item was pulled due to a controversy over original authorship. The longest new item appearing in the book was "Experience of the McWilliamses and the Membranous Croup." 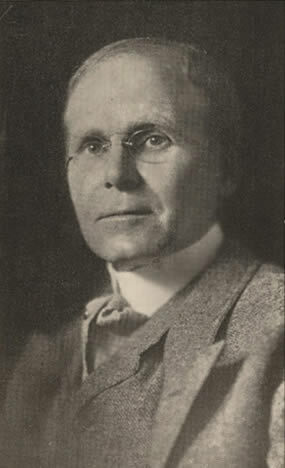 Illustrator True W. Williams provided 130 illustrations for the volume. An 1893 edition issued by Watson Gill and American Publishing Company for the holiday season utilized new printing plates, reduced the number of stories from 63 to 48 and eliminated many of Williams's original illustrations. When Frank Bliss of American Publishing Company issued Sketches, New and Old in the 1899 uniform edition, Clemens had an opportunity to revise and refine his work. However, the extent of his participation in the project was limited to marking up a copy of the old index indicating "Dates of WRITING -- & usually of publicat[ion] to the best of my recollection ... I think that the things whose dates I have forgotten were mainly squibs which I put into a 'Department' in the Galaxy magazine in 1869-70 -- or possibly it was '70-'71" (Branch and Hirst, p. 652). Bliss utilized the dates Clemens had provided as footnotes on the first page of a number of the sketches. A number of the dates Clemens provided were simply wrong and Bliss apparently never checked to verify them. 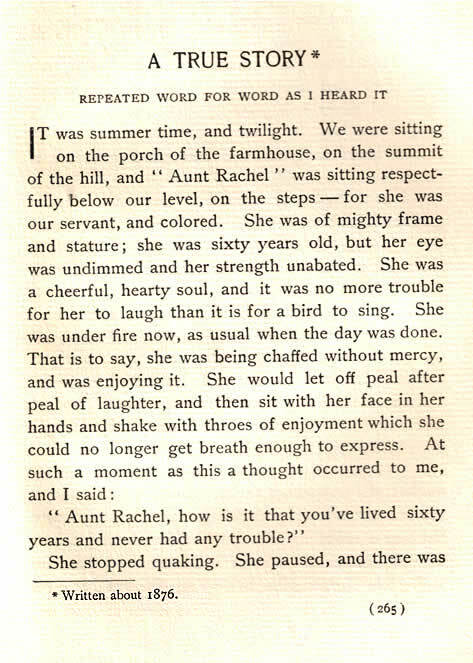 For example, "A True Story" was published in Atlantic Monthly, November 1874. The date of 1876 which appears in the lower right corner of the page from the 1899 uniform edition of Sketches, New and Old is an error by Clemens himself. Page from 1899 edition of Sketches, New and Old showing date error of 1876. Bliss eliminated one sketch titled "The 'Blind Letter' Department, London P.O." from the 1899 uniform edition, probably because it consisted mainly of illustrations. Thus the number of sketches in the 1899 uniform edition totals 62. Evidence suggests Morgan corrected some of the texts and compared some of them with the original Galaxy printings. However, the original text of Sketches, New and Old remained virtually unchanged throughout Clemens's lifetime. Frank Bliss planned at least three volumes of Mark Twain's sketches with Volume 19, Sketches, New and Old, being the first. However, instead of using the book's title on the spine of the volume, Bliss instead chose to identify the book as Volume XIX / Short Stories and Sketches I. This designation appears in all the uniform editions published by American Publishing Company including Autograph Edition, Edition De Luxe, Japan Edition, Author's De Luxe Edition, Royal Edition, Underwood Edition, Riverdale Edition and Hillcrest Edition. 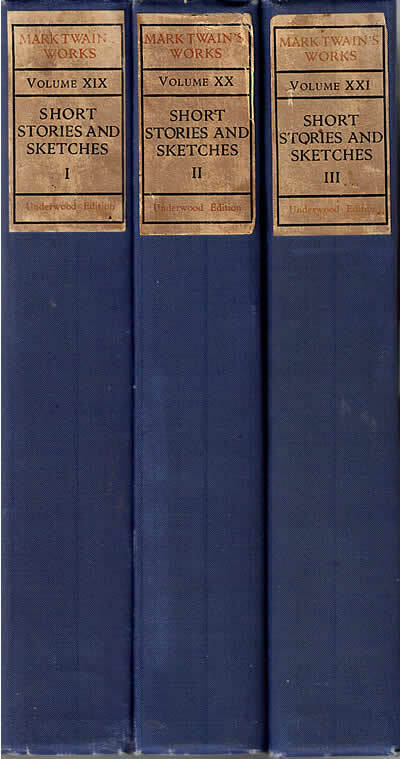 However, with the Harper Author's National Editions of 1909, the title appearing on the spine of Volume 19 was changed to match the title of the work and perhaps reduce confusion. 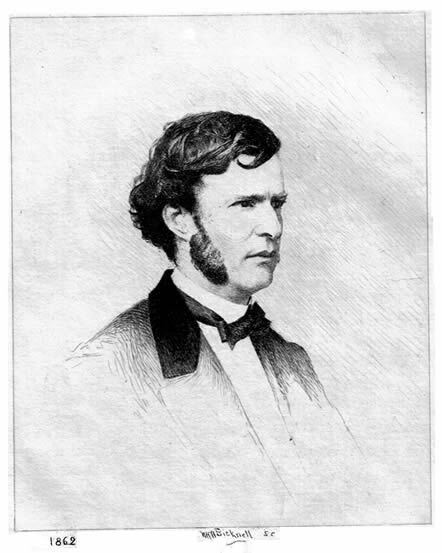 Frontispiece of Volume 19 etched by William Harry Warren Bicknell based on a photograph from 1862. Frederick Burr Opper (b. 1857 - d. 1937) was born in Madison, Ohio. His father Lewis was an Austrian immigrant and his uncle Adolph Opper was known as "De Blowitz," a Paris correspondent of The Times of London in the 1880s. Opper attended public schools in Madison, Ohio and at age fourteen began work as a printer's devil at the local Madison Gazette newspaper. Some of his earliest humorous drawings appeared in the magazines Wild Oats, St. Nicholas, Scribner's and Century. Opper moved to New York and studied briefly at Cooper Union and also for short time was a pupil of Frank Beard, older brother of Daniel Carter Beard. At age twenty he was employed on the staff of Frank Leslie's publications where he worked for three years. In February 1880 he joined the staff of Puck and remained with that publication until May 1899. He was hired away from Puck by William Randolph Hearst to draw political cartoons and comic strips for Hearst's New York Journal and remained with Hearst's newspaper for the next 33 years becoming one of America's most popular and wealthiest political cartoonists. 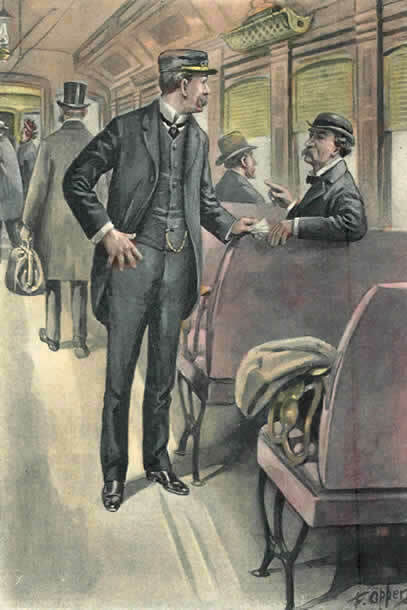 Opper contributed six full-page illustrations to the 1899 uniform edition of Sketches, New and Old. A receipt from Opper to American Publishing Company survives in archives at the University of Virginia Library, Special Collections indicating that Opper was paid $360 on February 8, 1899 for his six illustrations. was hand-colored and used as the frontispiece for the 1901 Riverdale Edition. Opper's name appears in Clemens's Stormfield Guest Book for September 20, 1908, a few days after burglars invaded Clemens's mansion in Redding, Connecticut. No further details of Opper's visit with Clemens have been found. However, newspapers across the country were publishing cartoons related to the burglary and although none by Opper have been found, it is possible he may have visited with that purpose in mind. Branch, Edgar Marquess Branch and Robert H. Hirst, eds. The Works of Mark Twain: Early Tales & Sketches, Volume 1: 1851-1864. (University of California Press, 1979). Duff, O. S. "Frederick Burr Opper, Most Humorous Cartoonist of the Day," Common Sense, Volume 9, January 1909, p. 11. Online via google books. Flower, Benjamin Orange. "Frederick Opper: A Cartoonist of Democracy," The Arena, Volume 33, June 1905, pp. 583 - 593. Online via google books. "Frederick Opper, Comic Strip Artist," The New York Times, 28 August 1937, p. 15. Twain, Mark. Sketches, New and Old. Japan Edition. (American Publishing Company, 1899). _____. Sketches, New and Old. (Oxford University Press, 1996). West, Richard Samuel. Satire on Stone: The Political Cartoons of Joseph Keppler. (University of Illinois Press, 1988).